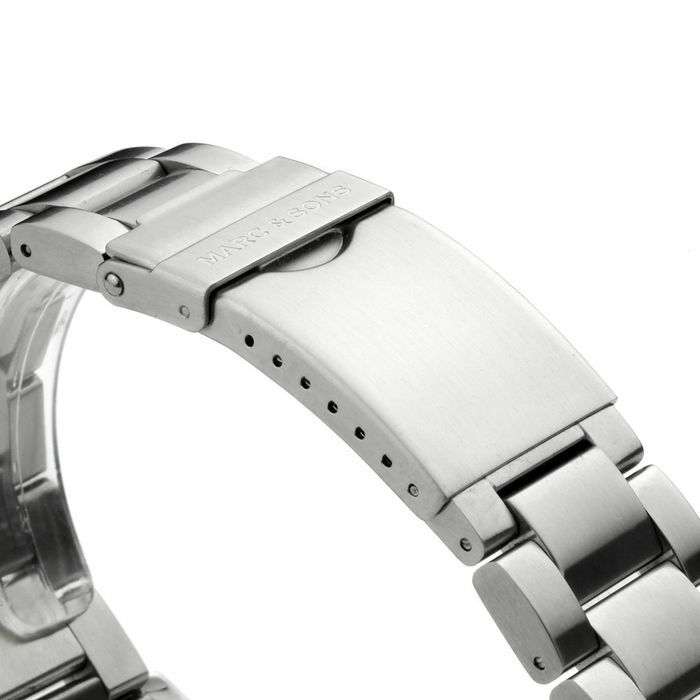 The watch is tested for a water tightness of up to 30 bar. This corresponds to the pressure of an assumed water column of 300 meters. The watch is suitable for daily use and can be worn, for example, by washing hands, rain, showering or car washing. Furthermore, the watch can be used in addition to diving with equipment. The illuminant used is called Superluminova BGW9. Superluminova BGW9 has a white color in daylight. In the dark, the elements are colored to a light blue hue. The luminosity is about 95 percent in direct comparison with Superluminova C3. Superluminova BGW9´s luminosity is superior to that of Superluminova C1 and Superluminova C3. The caliber SII NH35 is a robust and very reliable mechanical movement, which works on the basis of the legendary Seiko 7S26 caliber. It has a hand lift and a second stop. The range deviation is indicated as -20 to + 40 seconds per day. According to experience, however, the work runs much more precisely, in some cases with a deviation in the single-digit second range. Furthermore, the plant has a date-short-circuit. The reserve is 41 hours. A ceramic base is a component consisting of a so-called technical ceramic, which has recently gained in importance in the watch industry. These beads are pressed under high pressure and fired at above 1400 ° C. This makes the strings extremely resistant, resistant and scratch-resistant. Its silky sheen is obtained by polishing the diamonds after production. An additional feature is the processing of Superluminova BGW9 on the ceramic element. Visually, there is hardly any difference between a sapphire crystal and a mineral glass. The specific material properties are considered, large differences can be observed. In contrast to the mineral glass, which resembles the quartz in its chemical structure, the sapphire glass is made synthetically and consists of high-purity aluminum oxide. A sapphire glass has a hardness of nine, which corresponds exactly to that of the natural precious stone sapphire, from which the name for the glass was derived. Mineral glasses have only degrees of hardness of six to seven. Due to the material properties, sapphire glass is extremely resistant, scratch-resistant and is also particularly resistant to breakage. Despite heavy usage a sapphire glass still looks like after the first day. 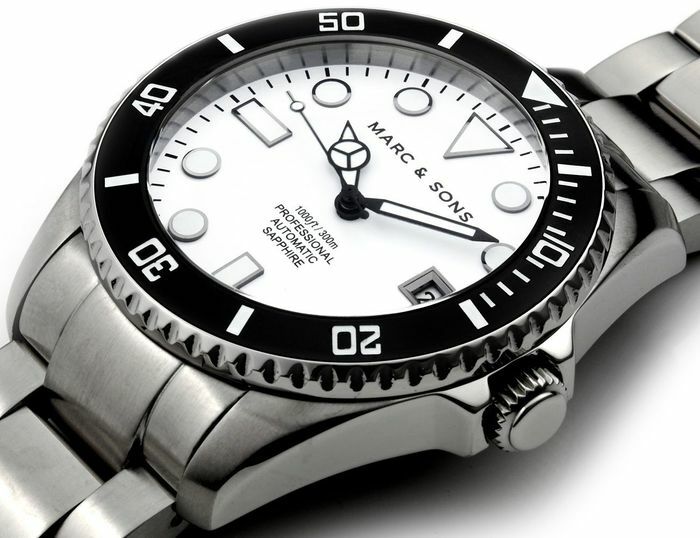 The MARC & SONS MSD-045 series is a versatile interpretation of a legendary and well known diving watch classic. 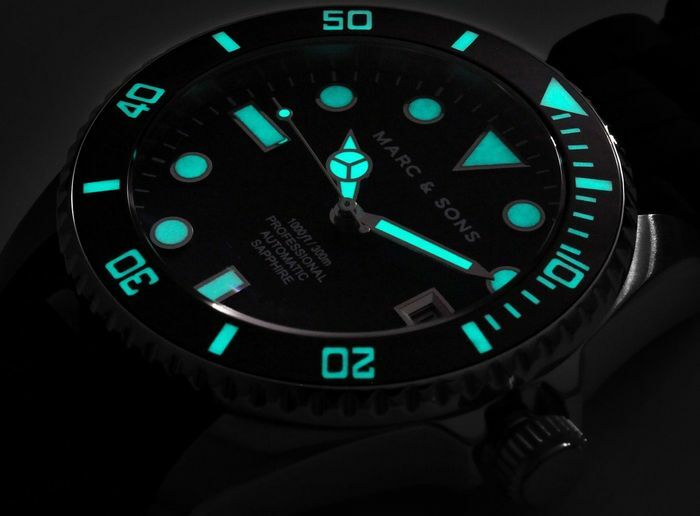 Here, MARC & SONS is focusing on design and processing. The watch has a beautifully shaped case with an antireflective sapphire crystal and is waterresistant up to 30 ATM. 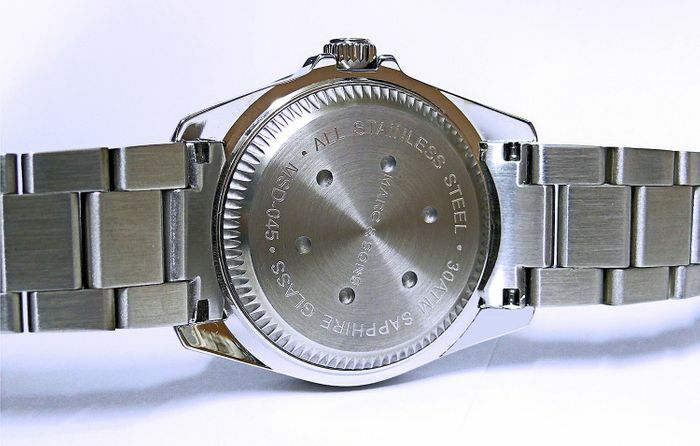 The one-sided turnable bezel has a ceramic inlay, which is equipped with Superluminova BGW9 luminous material. This also applies to hands and indexes, which light up in a bright blue in the dark and thus underline the sporty character of this watch. The watch is powered by an automatic movement from Seiko. The movement NH35 impresses with its reliability and is fine-tuned before the assembly by our watchmakers. 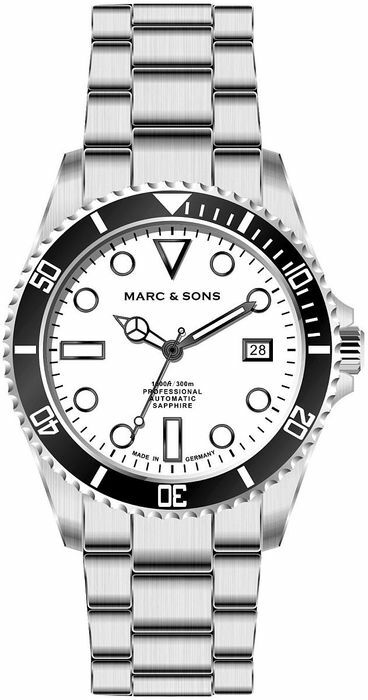 The MARC & SONS MSD-045-6S has a well-readable white dial. In addition to the classic stainless steel band, the watch can also be combined with a rubber band, a leather band or a sporty Natoband, thus forming the perfect combination of sportiness and classic elegance.